Driven by duty and guided by honor, Robert E. Lee achieved legendary status as a true hero of the Confederate South during the Civil War. His dazzling military maneuvers brought about many victories for the outmanned Confederate Army before succumbing to Union forces at Appomattox in 1865. Even in defeat, Lee served as a symbol of courage and dignity, embodying the finest elements of a true Southern gentleman. Meticulously designed by American Mint - in conjunction with The National Civil War Museum - for the Sesquicentennial of the Civil War, this set of three remarkable coins is a brilliant tribute to strength and devotion of the Confederacy's legendary general. 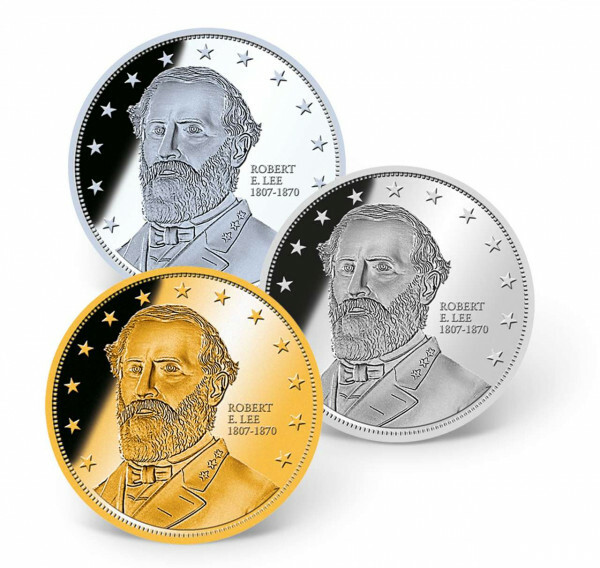 Each coin features a highly detailed image of General Robert E. Lee on the obverse and is exquisitely layered in a preciousmetal: one in 24k gold, one in .999 pure silver, and one in pure platinum! These coins are minted to the highest quality "Proof  standard and come in a beautiful wooden collector box, custom-craftedto preserve and display your precious coins for generations to come - a true collector's item.